This is excerpted from DNAinfo. You can see the article in its entirety by clicking here. We continue to lobby our regulatory authorities for permission to do similar work here in Boston Harbor. BROAD CHANNEL — More than $16 million has been slotted for a series of projects that will help protect and revitalize the city's coastline, including one that will help fund the restoration of Jamaica Bay's oyster population and wetlands. The grants, part of $100 million given out for projects along the Atlantic coast,were announced Monday by Secretary of the Interior Sally Jewell, and are funded through the billions of dollars allocated for recovery after Hurricane Sandy. "We are taking the lessons learned from this natural disaster to help local communities strengthen natural barriers between themselves and major storms such as Sandy that can cause major flooding and other damage,” Jewell said in a statement. Three of the winning projects in New York City will help strengthen and restore Jamaica Bay, including replanting wetlands grass in Broad Channel. 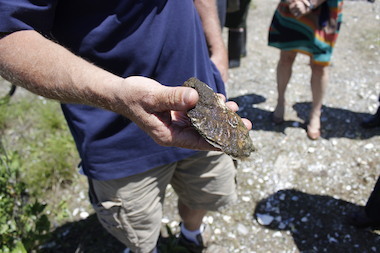 The project to restore oysters received a $1 million grant. Oysters — which up until the early 1900s thrived in Jamaica Bay — can clean the water in the bay and local activists and environmental groups have been working to restore them. The plan is to have the oysters available for consumption at some point, but it is not clear when. "Jamaica Bay is enormously important...because it's a natural lab and a classroom for millions of students right here in the greater New York, New Jersey communities," Jewell said after participating in planting wetlands grass with students from P.S. 47. That project received more than $4 million, and more money will also go into restoring 11 acres of salt marsh at Spring Creek Park. Don Riepe, a member of the American Littoral Society who watches the area as the Jamaica Bay Guardian, said the announcement was a "great day for the bay." He noted that the money, which also include additional funds from private groups and city agencies, "is a lot more than we're used to seeing coming into the bay." "We're glad that all the state, federal and local interests and stakeholders are working together now to do this," he said.